Super Hero Boy: This turns your idea of a shape sorter on its head. This turns your idea of a shape sorter on its head. Let me introduce you to our good friend Eebee. Eebee is one of our sponsors to Blogher and let me tell you right now that it was super important to me that the people sponsoring me for Blogher were products I could really be proud to represent and Eebee Adventures is no exception to that rule. Eebee's Adventures is a dvd series that I will have a full review of here shortly, and we did a review of the cloth books not long ago as well. I'm still not caught dead without a Eebee cloth book in my car at all times as they are one of the few things that will occupy Connor for a good lenght of time in the car as they are more toys than books but hold the appeal of both. The first time we actually got to "meet" Eebee though was in the form of the Eebee If the Shape Fits toy. You most likely wondering why I call it "meeting" Eebee, heh, well as far as Connor is concerned Eebee is real and he carries around and plays with his own Eebee doll strangely the same as if he was interacting with another baby. Something about the size of the toys and Eebee itself makes these toys really inviting. Not to mention that the Eebee on the dvd series looks exactly like the dolls so I really think Connor just thinks that the Eebee on the TV is the exact same Eebee thats sitting in the chair with him. Back to the toy at hand... the If The Shape Fits Eebee toy is really unlike any other shape sorting toy you have ever seen. Included is a 12" Eebee doll and four soft plush shapes that fit easily on Eebee's arms and legs, as well as stretch to fit over any one's arms or legs including your babies, yours, or even the family dog. I had to mention that part as Connor attempted this as soon as he realized the shapes fit on my arms they must fit on Melos's neck. Melos, my chihuahua, was not nearly as impressed with this fact but they do infact fit. heh. I wouldn't consider it a traditoinal shape sorting toy as there is no central pole where you stack your shapes as you use your own arms or legs as the venue. What really makes the If The Shape Fits Eebee toy really special is it really forces you and your child to interact in a way that you might not previously. The baby gets to explore his or her own body by wearing the forms on their arms or legs as well as explore the caregiver by putting the forms on his/her arms as well. 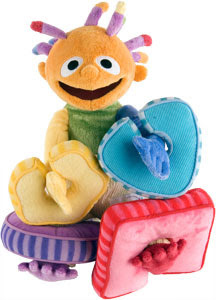 Really that is what makes Eebee so unique and incredibly special, all of the toys and dvds in the Eebee collection are specifically designed to encourage the caregiver/child connection. The shapes are plush so they are much more inviting to touch and feel than plastic forms. Not to mention that the toy will grow with your child as once your done playing with the plush shapes the doll is the perfect companion for infants and up. Connor regards his own Eebee with the sort of regard as you would a best friend. You should really go and check out all the Eebee products on the Eebee Adventures website! While your there pick up your very own Eebee If the Shape Fits toy! Stay tuned for more information about Eebee as we get closer to Blogher as I'll be talking about them alot in the coming weeks! I have one If The Shape Fits Eebee toy to give away to one lucky reader! Leave a comment on this post. Check out Eebee Adventures and look at their toy selection. Let me know which toy most intrest you and why. TWO extra credit per person. Please post your extra credit in a separate post. is really cute! Thank you! I like the Have A Ball Set. The Peek-a-Boo Eebee is our fave. Lily loves to play 'BOO'! I like the books. I think my grandson would enjoy these. I like the Bathtime Ebee would be great fun for bathtime! I like the bath time Eebee because my son loves bath time. Thanks for the chance. The Bath Time eebee Plus DVD sampler looks fun and my daughter loves bathtime. She doesn't have a shape sorter yet either! I'd love to get the peek-a-boo adventures because my little one loves books but this one would be so fun because it's interactive too! I like the bath time eebee because my daughter loves baths. The Have A Ball book looks like a great one for little hands. I like Bath Time Eebee because water play is so much fun. Thanks for the chance. I like the Snuggle Time eebee. It reminds me of the taggie blankets my daughter loved when she was smaller. I love the Bath Time Eebee. Maybe with something cute like that I could get my granson to actually like the tub, or at least be entertained so he doesn't notice where he is so much! Bathtime Eeeby! That would be great for my son! I like the Peek-a-boo eebee for my little grandson because he loves that game. I love the little Bowl Me Over set. My eleven month old is just starting to get the concept of rolling (or chunking!) balls so this could be so much fun. The eebee's Bowl Me Over Set is quite interesting. It's cute and would be a fun way for the little one to go bowling. My kids would love the eebee doll! We love eebee. I love the bath time eebee! I think it's so cute and will make bath time more fun for my babes! I really like the books, my favorite would be Have a Ball Adventures! The bath time eebee would be awesome for Brea. She loves bathtime and I love that it has a dvd to inspire bathtub learning activities! I like the Peek-a-Boo Eebee. It's cute and would be fun for my son. He loves the game peek-a-boo. Lots of fun for a baby! I like the eebee hand puppet, I think my son would enjoy playing with it a lot! The bath time Eebee is darling. My children loved their bath time and I'd love to give this to my nephew! I think the eebee's Have A Ball Set sounds like a great toy. I like the bath time eebee, it would make bathtime more fun for my daughter! i love the eebee doll - 17"